Have You A Company Car BIK Tax Exposure? There are many good reasons why employers choose to offer staff company cars - from attracting and retaining key talent or to minimising vehicle risk. Unfortunately, this important benefit also comes with Benefit-In-Kind (“BIK”) Tax which employers need to manage appropriately. DriverFocus has researched current best-practice around tackling business mileage and discussed the issues with Ireland’s leading tax and payroll professionals. In this article, we share our findings and explain why now is a really good time to review how you record and report business mileage. From January 1st 2019, the Revenue Commissioners in Ireland have introduced major changes to the PAYE system. A key element of this modernisation programme is the need for employers to report PAYE in real-time. What this means in practice is that instead of a year-end reporting obligation, employers are now expected to submit a return each payday. "You will need to calculate the ‘cash equivalent’ of your employee’s private use of the company car. The cash equivalent is a percentage of the Original Market Value (OMV) of the car. The percentage is based on the amount of mileage for business purposes". "Company cars are typically provided for the full year, and the distances for determining the applicable tax rate are based on the number of miles/kilometres driven in the calendar year. Many employers struggle to get their employees to maintain and submit accurate logs on a regular basis, with the result that the employer may include the highest BIK amount (or an estimate based on the prior year’s mileage) and then perform a true-up semi-annually or at year-end. Particularly for employers who process weekly or fortnightly payrolls, it would involve significant additional business process to request, obtain and review all employee mileage logs on a weekly/fortnightly basis." “You should review notional pay regularly (at least quarterly) to ensure the payments reported to Revenue are as accurate as possible”. Accountancy firms with experience in this area, report that business mileage and BIK tax have consistently been among the top areas of interest when Revenue engage in what they refer to as “Timely Targeted Interventions”. With tapering relief on BIK tax for higher levels of business mileage, if anything, there can be a temptation for some individuals to claim more business kilometres than actually driven. Coupled with recently increased resources and REAP - Revenue’s compliance profiling system - it is anticipated non-compliance risks will be targeted earlier and more frequently. Another consequence to note is that from 2019, there are also increased penalties for underpaid tax. For example, the fixed penalty of up to €4,000 per incorrect return, effectively means a potential penalty of €48,000 for any given year. This is in addition to statutory penalties which range from 3% to 100% of the tax due. Finally, in cases where PAYE tax on mileage and travel expenses is not correctly withheld, the tax will be recouped by Revenue on a grossed-up basis, meaning that every €1,000 paid to employees will cost the employer €2,309 including tax and employer PRSI. Note: this example is based on just one driver, for one quarter and for one band change. Clearly the tax and penalties can be higher if any of these three conditions are increased. Undertake a tax review to help identify potential gaps in your current processes, including any company car BIK tax and/or business mileage reimbursements for grey fleet drivers. You should speak with your tax advisor for guidance and/or see below for further best-practice guidance and contacts. Ensure your BIK tax deductions follow Revenue rules, see Revenue’s BIK Ready-Reckoner for instance. Of course, Revenue are well aware that claimed business mileage logs submitted on Excel, may or may not reflect the reality of business trips undertaken i.e. whether trip distances are exaggerated or if the journeys occurred at all! As a consequence, Revenue audits invariably target company car BIK / business mileage expenses as a relatively easy way to show a return on tax audits. Consequently, this practice was likened to “shooting fish in a barrel” by more than a few tax experts! Simple to use digital technology can also help you ensure tax compliance by providing evidence of actual - rather than claimed - business trips in the form of an electronic logbook. Reducing the hassle of mileage administration for staff who are on the road, also means that they will have more time to spend on more productive activities. A third benefit is that payroll professionals - already facing an increased reporting burden - will not have to wait for or spend so much time chasing mileage logs. Today, most employees - over 80% according to an IPASS Survey in 2017 - use the likes of Excel to report business mileage. Of course, such claimed mileage can include fictitious trips or “rounding-up”. There is though, a better way to ensure that your business is not exposed to additional costs and tax penalties as outlined above. While commercial vehicle telematics (commonly referred to as “trackers”) typically have some trip distance reporting functionality, these systems tend to be too complex, expensive and/or are viewed as “big brother” by staff, for the purpose of simply logging Revenue-required, business trip data. In contrast, smartphone app technology - such as DriverFocus Ally - can automate actual business mileage capture while being a simple, positive and respectful experience from a user perspective. Whatever mileage capture system you implement should greatly help remove the “low-hanging fruit” the next time a Revenue Inspector comes calling. And of course showing strong compliance around BIK and mileage should lessen the chances of a more extensive Revenue intervention! PwC - PAYE Modernisation: Are you ready for real-time reporting? Driving for Better Business ("DfBB") has just launched its new Grey Fleet Review. It is the first of what will be a series of in-depth reviews into topics that can have a significant effect on both the risk profile and the operational costs of any organisation. The Review outlines duty-of-care and liability dangers for organisations running grey fleet vehicles without proper policies and checks in place – and how employees can be caught out financially if they fail to do the sums. On a Wing and a Prayer - Research shows that grey fleet drivers across Europe are not undertaking basic vehicle maintenance. Out of Control - Companies are losing essential controls for monitoring safety, emissions and compliance. Why your true grey fleet may be bigger than you think - Many businesses with active grey fleets simply do not realise the level of responsibility they have. How do DfBB Champions manage Grey Fleet? - Examples of how a selection of our Driving for Better Business Champions manage their grey fleet. Driving for work is recognised by ABB as a high-risk, high cost but fundamentally necessary business activity. Since its inception is 2009, ABB’s Safe Driving for Work Programme - in partnership with Dublin-based DriverFocus - has seen the company sustain a reduction in road incidents and motor claims costs and frequency of over 50%. This performance is viewed as evidence that the majority of work-related collisions in ABB Ireland are preventable when everyone - drivers and management - play their part. The decline in the cost of collisions is also a compelling return on the time and resources invested in proactively improving the company’s driving environment. Find out how ABB Ireland achieved these amazing results here. Research, commissioned by workforce management company BigChange and the road safety charity Brake, has been published to coincide with the launch of Leaders for Life, a new campaign to help business leaders promote safer driving at work. It shows that older bosses are most guilty of being disinterested in their employees’ driving. More than half of employers (54%) aged over 55 with responsibility for company drivers take no action to monitor or manage their behaviour, despite nine in ten (87%) saying that road safety is an important concern. By contrast, just 6% of business leaders aged 18 to 34 fail to monitor their drivers. Young bosses employing company drivers are nine times more likely than their older counterparts to take steps such as implementing vehicle tracking, license checks and random drug and alcohol testing. The survey also revealed that business leaders are more concerned about cyber security than road safety. While 57% of leaders surveyed said that road safety was ‘very important’ to the operation and reputation of their organisations, the figure increased to 63% when asked about cyber security matters. Fleet Risk Check is an interactive evaluation of your current level of fleet-related risk. Risk Audit will help you establish how your organisation is managing the risks associated with occupational driving, as well as highlighting areas of weakness, and tailored support is on offer to help you address the issues and concerns you may have. The risk assessment is divided into four sections, each of which requires you to answer a series of exploratory questions, after which you will be able to download a personalised report showing your current position and with guidance on where and how you should look to improve. Access to the tool can be found here. The occasion of this question was the annual conference of the Institute of Car Fleet Management and the speaker who posed the question was Tony Greenidge of IAM RoadSmart. Both organisations are registered charities. Let’s look at the numbers Tony presented, which show how a change in driver behaviour can dramatically cut costs. He assumed a fleet of 80 cars and 20 vans, averaging 15,000 business miles per annum, having a 15% chance of an at-fault collision every year and a four-year replacement cycle. A fairly typical medium-size fleet. He presented well-sourced stats that showed that 37% of leased cars and 40% of leased vans are returned with unfair wear and tear, for which the leasing companies charge an average £308 and £414 respectively. That’s a cost of £3,107 for our example fleet, a fair chunk of which might be down to driver behaviour. The average motor insurance claim is £2,839 (Source: ABI, 2017), and this figure is rising as cars become more complex. If 15% of our assumed fleet is involved in an at-fault collision every year, the cost to the fleet will be £42,585. How much of that could be reduced by changes in driver behaviour? Presumably rather a lot, as these are at-fault claims. Tony assumed that his fleet of 100 vehicles driving 15,000 miles per annum had an average 44mpg under WLTP, but that the fleet actually averaged 40mpg. He showed that a cost saving of £18,908 was achievable if the driver could be encouraged to drive in a fuel-efficient way. Then we came to the interesting part, which I hadn’t been aware of. The EST provides a subsidy to approved training organisations for every driver they put through an ecodriving course. This can reduce the per-head cost of a standard 90-minute course to £30-£40, depending on the provider. For the assumed fleet of 100 vehicles, the potential savings from ecodriving is £64,600, or £646 per driver. Let’s say the 90-minute ecodriving course costs £40 per head, or £4,000 for all of the drivers. That’s a potential return of more than 16 times the investment. Fleet World reporter Colin Tourick ended the article by asking: "Costs reduced, emissions reduced, accidents avoided, lives saved, all for £40 per head and 90 minutes outside the business. Why isn’t everyone doing this?" 2. If EST funding is not an option, the commercial rates for in-vehicle driver training is significantly higher (again a multiple of 3X or more), which reduces payback. Still, the business case for being proactive is strong. 3. Aside from training everyone, a targeted training programme - based on telemetry, fuel card data and/or risk assessment data - could reduce the training cost and improve return on investment. As part of Drive Safely Work Week™ (DSWW), the US-based Network of Employers for Traffic Safety ("NETS") has just released quality Campaign Materials to support employers looking to tackle Parking and Reversing as part of their Safe Driving for Work Programmme. NETS membership is open to all employers who have vehicle fleets. If you are a vendor company, or are a government/non-profit organisation, please contact Susan Gillies at sgillies@trafficsafety.org or +1 (703) 755 5350 for membership information. Collision Costs - Is Your Head in the Sand? When crashes occur, fixing the bent-metal is relatively easy and low-cost. Just as the human cost can be significant, so too can the hidden costs. * “One of the challenges is that many of these figures never appear on a balance sheet,” says Andy Price, director of consultancy Fleet Safety Management, adding that “all the CFO sees is the insurance cost and maybe the cost of the excess. They don’t see that the employee was absent for seven hours trying to sort the issue out with the leasing company, or worse that they are off injured as a result of the collision"
* In terms of the human cost, a driver’s well-being should also be considered. Clare Cain, group insurance/risk manager at Kelly Communications, says: “You have to offer support following a collision, not just to improve the driver’s skills, but also to ensure they aren’t suffering from stress or depression"
* Colin Hartley, managing director of risk consultancy Driive, adds that the “ripple effect” means the impact of an incident goes far beyond the driver. The ETSC has just released a really simple infographic for employers on how to use in-vehicle safety technology - such as seatbelt reminders, intelligent speed assistance (ISA), alcohol interlocks, telematics, lane keep assist ad automated emergency braking (AEB) - as part of a work-related road safety management programme. New car technology and autonomous features are truly great and life-saving. That said, they are not available to all today and there is a significant hype which the ETSC advised in March, "threatens to hold back progress... in reducing the 1.25 million deaths that occur annually on the world's roads". Most crashes today can be avoided and technology - as part of a fleet risk programme - can help reduce risk by 50% or more. The key to this, we believe, is managing driver behaviour. Here are 10 Tips that we/TomTom Telematics published back in 2015 that are still valid. Also, data gathered by DriverFocus over recent years, provides some insight on HOW the average at-work driver performs - both with and without "supervision" in the form of a "behaviour monitoring programme". For example, just 3% of unmonitored drivers managed to score as well as the average monitored driver! In short, we're big fans of technology to improve driving for work risk, however creating the right environment that supports and expects good, safe driving behaviour requires a little more thought and effort. The results are real and well worth it! This combined seminar and demo event to be held in Leopardstown Racecourse Pavilion on 17th April, is a great learning opportunity for employers, fleet managers, employees who drive for work and anyone involved in safety at work including leasing companies, insurance agencies, human resource managers and City/County Council safety officers. Delegates can expect to find out how developments in car safety technology can aid fleet and company car drivers. As you are probably aware, there is an increasing onus and responsibility on employers, fleet managers and company bosses to ensure the safety of employees undertaking company related travel. Whether an employee is driving a company supplied vehicle or their own car, employers have a duty of care to ensure that not only have they appropriate policies and procedures in place, but that the car being used is fit for purpose. A key component in ensuring safety while driving for work is the vehicle itself. Highlighting how the latest safety technology now available in cars can assist employers in meeting their duty of care obligations is the focus of an important Safety Seminar and Demonstration being organised by Fleet Car Magazine. In addition to a series of presentations from leading experts, attendees will get an opportunity to experience first-hand the latest generation of safety features which are fitted as standard to the 9th generation Honda Civic via the brand’s highly lauded Sensing Technologies package. Details: Tuesday 17 April, 2018 - Leopardstown Racecourse Pavilion, Foxrock, Dublin 18 - between 10.30am and 2pm. It is free-to-attend and includes a complimentary networking lunch, but early registration is required as places are limited. 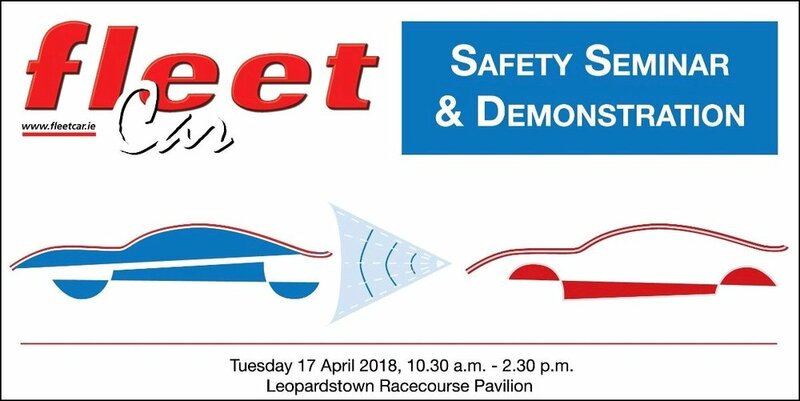 To register for the Fleet Car Safety Seminar & Demonstration, please contact Anne Marie Grant at Fleet Car magazine | Email: events@fleet.ie or mobile (086) 1451330. Is Your Business VanSafe Ready? FTA Ireland is hosting a briefing on it's VanSafe initiative in Citywest, Dublin on April 11th. VanSafe is an industry-driven programme designed to advise and support van fleet operators, raise operational standards and recognise excellence. VanSafe is fast becoming the recognised benchmark in Ireland for a compliant van fleet. To gain the VanSafe standard, fleet operators must pass a systems audit covering Vehicle and equipment maintenance, Maintenance cycles, Vehicle standards, Vehicle administration, Driver licensing and competence, Driver behaviour and Sustainable operations. If you can evidence a robust system that supports safe driving for work, why not aim for VanSafe and showcase your commitment? With key speakers from the Health & Safety Authority, An Garda Siochana and AA Ireland, this important briefing will highlight the benefits of identifying and managing the risks associated with operating a fleet of Light Commercial Vehicles (LCVs). DriverFocus is proud to support VanSafe along with ENPROVA, Transpoco, insuremyvan.ie, Merrion Fleet Management and AA Ireland. To book your place, simply send your name and contact details to info@ftai.ie and include "VanSafe - DriverFocus" in the subject line. Event Details: April 11th 2018 in Citywest Hotel Dublin from 4.30-6.30pm. ETSC Warns Of "Hype Surrounding Automated Driving"
In a recent article in the Financial Times, the ETSC was very clear in warning of the delays in improving the minimum safety standards of vehicles for almost a decade. "The hype surrounding automated driving threatens to hold back progress over the next few years in reducing the 1.25m deaths that occur annually on the world’s roads. But delaying or avoiding action now would be a disaster. Especially so if, as is likely, full autonomy faces huge practical obstacles to implementation along the way." Last week in Newbridge, Co Kildare, saw the hosting of the first Cross-Industry Forum on Road Safety in Ireland. This successful half-day event is an inspired initiative by the ESB and is just one of a number of elements of the company's "Road Safety Strategy 2013-2020: Our Journey To Excellence". Leading road safety champions and DriverFocus clients, ESB, ABB, Irish Rail, SSE and Ervia were joined by representatives from eir, An Post, KTL, KN Networks and other organisations to share their experience and best-practices in managing work-related road risk. Well-planned and ably facilitated, there was fantastic, active participation from all, in the series of workshops, which covered a wide-range of driving-related topics including grey fleet, driver behaviour, telematics, audits, distraction, driver communications, driving for work policies and daily vehicle checks. DriverFocus and FTA Ireland were invited along to support the forum with stands featuring relevant information and resources. At the close, strong interest expressed for the next event, with several offers to host - a definite sign that the Forum was heading in the right direction! It puts you, your business and your reputation at risk". Plan: Assess the risks in asking your staff to drive and create a plan to minimise those risks. Do: Create a safe driving policy, communicate it well to your staff and ensure they follow it. Check: Monitor compliance, collisions and costs. Act: Continue to refine and improve your policies". [see also our "Hallmarks" of best-practice]. Box-Ticker: Doing “something” they hope will be enough for legal compliance but not leveraging any business benefits. Remember, the "something” applies to everyone who drives on business, however often or infrequently and whether they are in a company vehicle, their own vehicle (the “Grey Fleet”), or a hire vehicle. And if you’re the one who makes decisions about drivers and vehicles, you’re the one who needs to ensure that the “something” gets done". # 4: "Running cars and vans can be an expensive business. While poor driving can obviously put your drivers and other road users at risk, it can also cost your organisation huge amounts of money, but often in ways you didn’t realise, eating into your profits without you realising". # 5: "The obvious costs such as insurance and repairs can be scary enough but did you know the hidden costs of a collision are generally between x4 and x32 the cost of repairing the vehicle? Staff absence is the biggest hidden cost to business following a collision. Whether it’s a spurious ‘whiplash’ claim or something more serious, this lack of productivity can really harm the business". # 6: The guide features "a series of 50 questions to see if your organisation is doing all it can to effective manage its work-related road risk and to help you identify where you may have important gaps" [see also, our Are You Ready? questions]. Additionally, "Not all the questions are about compliance, some are about good practice and going beyond the legal minimum to ensure drivers and road users are as safe as possible, and that the company is maximising the benefits that come from better management of those who drive for work". # 7: To help you Measuring Your Collisions and Costs "we’ve created a spreadsheet template on which you can enter the most important data. You can download the template and the example at www.drivingforbetterbusiness.com under Getting Started/Measurement". The USA's Network of Employers for Traffic Safety (NETS) is an employer-led public/private partnership dedicated to improving the safety and health of employees, their families, and members of the communities in which they live and work by preventing traffic crashes that occur both on- and off-the-job. NETS has this week released a new Cost of Collisions Calculator, developed by NETS through a cooperative agreement with NHTSA, which can be utilised by employers* to measure their company’s cost of crashes. Employers pay for injuries that occur both on and off the job. In the USA in 2013, motor vehicle crashes killed more than 1,600 people and injured 293,000 while they were working. More than half of the injuries forced people to miss work. Overall, on-the-job crash injuries (fatal and non-fatal) amounted to about 7.5 percent of all crash injuries. Motor vehicle crash injuries on and off the job cost employers $47.4 billion in 2013. Almost one half of this cost resulted from off-the-job injuries to workers and their dependents. Knowing an occupational fleet’s costs enables management to develop a business case that supports an investment in fleet safety. Knowing the on- and off-the-job crash costs for all employees and their dependents provides employers with justification to invest in employee-wide safe driving programs. expenses to employers without reducing the benefits offered to employees. 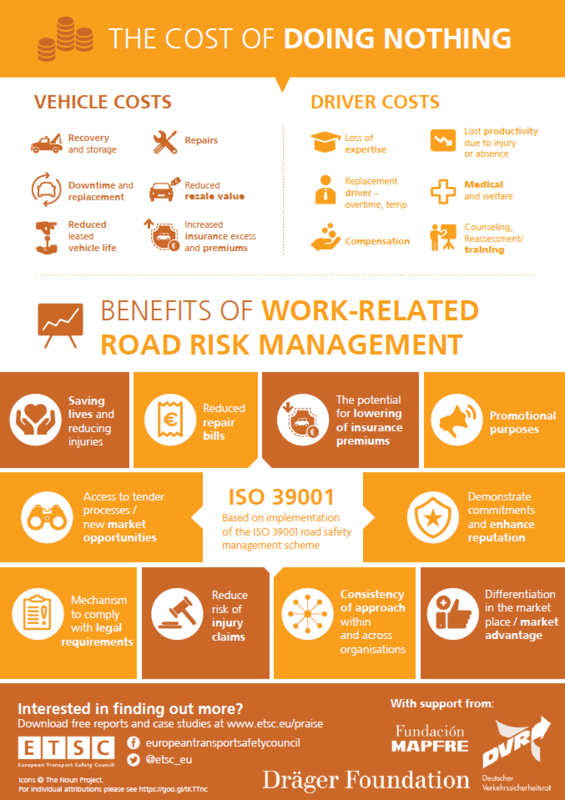 Whether their organisation needs to manage Road-Risk?